Summer 2014 was a life changing summer. On a spontaneous whim at midnight in my twin xl dorm bed I applied for an international marketing course for 6 weeks in Spain. Although a little rusty on my high school Spanish, I got on a plane at John F. Kennedy airport, closed my eyes, and woke up in Barcelona, Spain. There are many beautiful things about Barcelona- the architecture, the beaches, the fashion. But to know Barcelona, and to truly love Barcelona, is to appreciate the food. Before my arrival in Spain, I researched the people, the culture, and the language. When I saw main dishes like arros negre, a dish in which the main ingredients included rice with squid ink, I knew I was in for an adventure. Before I left I declared to my mom that I would try as many things as possible, but I would not eat squid ink. As fate would have it, on our first full day in Spain the restaurant where our professors took us to lunch had arros negre on their menu del dia, and I went for it. There are so many different things I could tell you about the food in Spain, from menu del dia 3 course lunch specials to the amazing Tapas crawl in which I got small plates and a glass of wine for 2 euro each, but this blog is called Erin Eats Upstate. After my summer in Spain I’ve attempted to find Spanish food here in Upstate New York but the options have always been few and far between. You’re sure to find some paella dishes around, and certainly a carafe or two of Sangria, but the traditional tapas like pan con tomate, patatas bravas, croquettes, and tortilla de patatas are rare, hard to find treats. I found out about Boca Bistro when I first came home from Barcelona in 2014 but it has taken me 3 years to finally set foot inside the restaurant. The delay was primarily caused by location, I live in Albany and spend far more time there, as well as exploring Schenectady and Troy. When I found myself hungry, and on a casual stroll in Saratoga, I knew exactly where to go. The restaurant itself is beautiful, albeit a bit smaller than I anticipated. We were seated by the window at a small table aside a beautiful brick wall. I don’t know what it is about a brick wall, but for whatever reason I’m instantly drawn to them. As we sat down we were given a food and drink menu, with a full selection of beer and wine. Despite my best judgement I didn’t order a drink, partly because it was the middle of the afternoon, but mostly to spend more money on food. On the drive home all I could think about was how much better the meal would’ve been with a nice red wine. While the menu included salads, sandwiches, burgers, and paella, I didn’t even give them more than a glance. After munching on some freshly baked bread dipped in olive oil (and eating some of the olives too) we ordered a selection of tapas including pan con tomate with manchego cheese, ham croquettes, and patatas bravas. Pan con tomate is literally bread with tomatoes mashed across the top when you order it in Spain. At Boca Bistro there were a few more components. They used cherry tomatoes cut in half, with olive oil, a tomato spread, and some sprouts for garnish. We added manchego cheese to the order, because why not, and the bread came with more olives (which I LOVE). You don’t need to speak Spanish to understand what patatas bravas are. You probably already guessed it, potatoes. Patatas bravas are traditionally fried potatoes cut into cubes with spices, and served with a garlic aioli and these did not disappoint. For an additional cost we could’ve added a fried egg or chorizo but I decided to keep the dish classic as I remember it. There’s always next time. The meal wouldn’t be complete without ham croquettes, although it probably would’ve been a bit healthier without these delicious fried ham and cheese fritters. Stuffed with manchego cheese and serrano ham, the plate came with 5 of these tasty croquettes. This is often a pet peeve of mine at restaurants. Why not serve an even number? 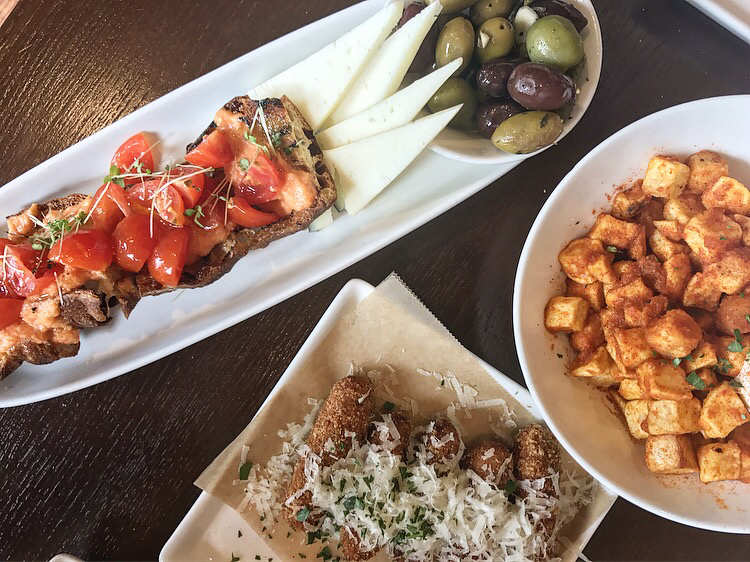 Especially when it comes to tapas when you know people are going to share… But I digress, overall if that was my only complaint, I’d say it was a pretty good meal. I was pretty full after these small plates and entertained myself by looking at the dessert menu, but ultimately had to decline. Although I didn’t get to try, if you are a dessert person I can only assume that the churros and chocolate is a worthwhile choice. With relatively inexpensive flights to Europe these days the goal is to save some money and return to Spain, revisiting Barcelona and exploring other cities like Madrid or Sevilla. But for the time being I will continue to find local options and reminisce about Summer ’14.